Since the tragic shootings at Sandy Hook Elementary in 2012 there have been at least 159 school shootings in America (Everytown, n.d.). This chapter focuses on application of Deweyan thought to school shootings and aesthetic responses. Educational and aesthetic theories are used to understand the effects of school violence and inquiry includes analysis of artful works made in response to shootings. Common themes are noted across all 3 sites in various aesthetic responses and the steps toward reconstruction of associated living. Findings suggest engagement in responsive art works may ameliorate the disruption and trauma of school shootings. Within aesthetic response, there is potential for reclamation, restoration, and re-presentation of experience through the doubled reconstruction of communal spaces/places and of relational identity after shooting incidents. Considerations include the use of aesthetic response and associated living practices by activist and educators as a potential means to understand and work against gun violence. Schools provide unique opportunities for civic engagement across the spectrum of joyful, prosaic, and even traumatic experiences. In general, Dewey (1916/2011) closely linked social practices of civic engagement, democracy, and education as modes of what he called associated living, “of conjoint communicated experience,” and a space of participation in common interests and actions (p. 50). Further, Greene (2005) makes the case for engaging the arts, or in the case of this chapter, an aesthetic response in times of civic unrest and crisis. She inspires teachers, “troubled and so often immobilized by feelings of helplessness” (p. 78) by local as well as global events, to enter into “spaces of imagination” (p. 77). While school shootings will never be acceptable, focusing on development of practices and strategies in the aftermath of shootings moves research toward a fuller context of teaching, learning, and civic re-engagement. In this chapter the authors analyze the engaged aesthetic responses to school shootings in three communities–Columbine High School (CHS), Red Lion Junior High School (RLJHS), and Sandy Hook Elementary School (SHES), where those affected try to come to terms with what has happened in a school setting. The first part of our research is to reveal particular perceptions, contexts, or understandings about works of art–in this case, artful response by those affected by school shootings. The second part of our research is the development a Deweyan model of conduct or steps of aesthetic response to school shootings, based on analysis of three identified communities. The authors explore the aesthetic dialog of art works to understand experience and socio-cultural context in the aftermath of school shootings with implications for applied and responsive strategies in educational settings and future research. Individual and communal responses can take many forms, such as legislation, citizen action, protest, and so forth, but it also can be found in public displays of art. An aesthetic response is the creation of a social artifact and a type of artistic expression that attempts to make meaning of a senseless violent event. It re-establishes relationships between those directly and indirectly affected and, potentially, can help to move forward in the aftermath (Bourriaud, 2002; Jackson, 1998; Levine, 2009; McNiff, 2004). 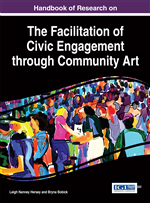 Social communication and civic engagement in aesthetic responses are active steps toward reconstruction of the bonds of associated living (Dewey, 1916/2011). Though definitions of and statistics on incidents of active shooter incidents in public places vary (DOJ, 2014), since the tragic shootings at SHES in December 2012 there have been at least 159 school shootings in America (Everytown, n.d.). This chapter focuses on pragmatic acknowledgment of violence and tragedy as an ongoing presence in schools (Warnick, Johnson, & Rocha, 2010). This is not banal acceptance; rather, it is a pragmatic shift toward developing strategies for civic engagement, teaching, and learning. Concepts outlined here are not meant to be prescriptive or to make causal links but, rather, are exploratory practices and ideas to consider after an incident of disruptive violence. An Experience: An instance or encounter that is generative in that the one who is experiencing undergoes a psychological transformation of the self, perspective, attitude, and/or knowledge. This change may be positive or negative depending on the circumstances. In terms of aesthetics and artwork, an experience is an intensified form of unified and flowing creativity. Educational Criticism: A form of ABER in which qualities, meanings, and significance of some situation or object are researched, analyzed, and interpreted through the lens of educational and aesthetic critique. The aim of the critique is to expand and reveal particular perceptions or understandings about works of art. Research promotes knowledge generation and meaning making through connections between the works of art and specific contexts, within educational situations and concerns. Social Artifacts: Objects, representations, assemblages, institutions, knowledge and conceptual frameworks that are used to attain a particular expression, interpretation, goal, or desired ends. The value of artifact is its capacity to reshape and have impact on perceptions, meaning making, beliefs, actions, and institutions. Associated Living: A combination of communal practices, communication, and social spaces of civic engagement, democracy, and education works to connect and unite people in common interests and actions. Experience: An instance of ordinary and daily interactions and encounters of beings, things, and environs–is understood as being situated in a particular context and time. It is aesthetic, transactional, and relational in that it is used to maintain understanding and interpretation in an ever-changing world. School Shootings: Incidents are classified as school shootings when a firearm was discharged inside a school building or on school or campus grounds, as documented by the press or confirmed through further inquiries with law enforcement. Incidents in which guns were brought into schools but not fired, or were fired off school grounds after having been possessed in schools, were not included (Everytown for Gun Safety (n.d.). Relational Aesthetics: An artful and relational event, re-presentation, or interpretative work that opens capacities for social dialog, bearing witness, response and compassionate reflection. Aesthetic Response (to Disruptive Events): Works of art made in response to disruptive incidents are transactional and communicative. Emotion and embodied senses serve to unify the experience and provide motivation for involvement in individual and community artful projects, in reply to the traumatic event. Arts Based Educational Research (ABER): A method of qualitative research that utilizes the arts as a primary way of understanding and analyzing experience. Three genres of ABER are identified as narrative construction and storytelling, educational connoisseurship and criticism, and nonliterary forms of arts-based inquired (Barone & Eisner, 1997). Research practices and modes of representation based in the arts reveal insights, generate understandings, and bring about meaning making about educational settings and issues that are difficult to attain through linguistic based research methods.